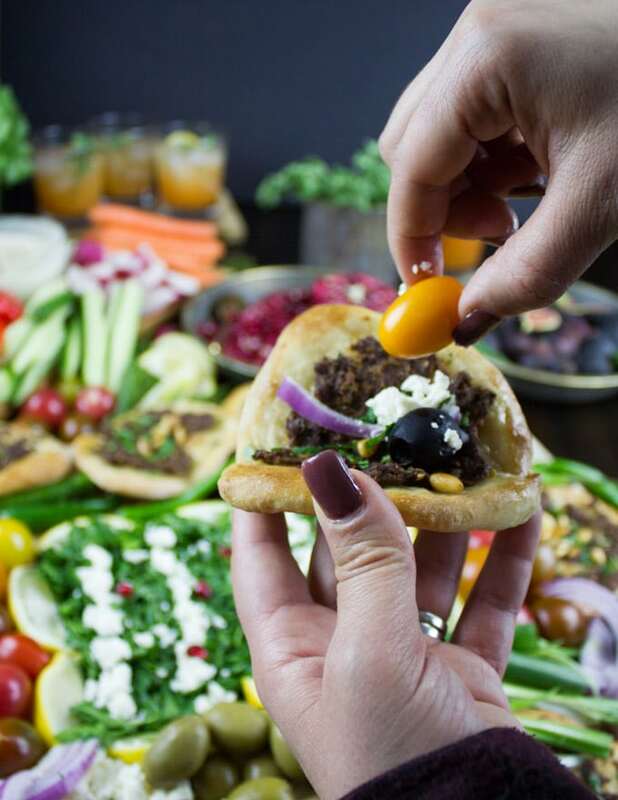 Game Day is absolute fun for us, so we always pick food that’s not just delicious, but totally fun to eat and assemble too! 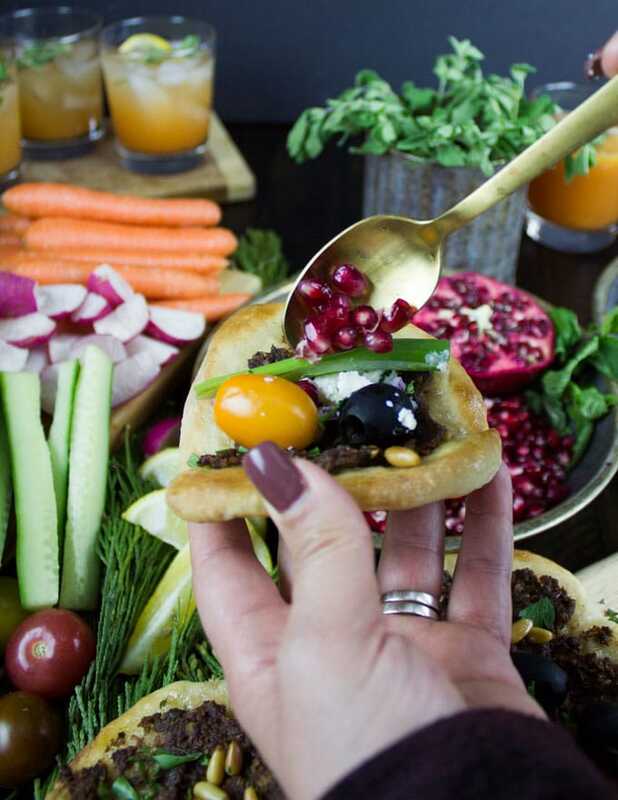 Make this Game Day Mini Turkish Pizza Party — It starts with flavor packed raw minced lamb with a special spice mixture on pizza dough, bake that at a high temp oven for a few minutes and once it cooks, enjoy endless toppings over it! 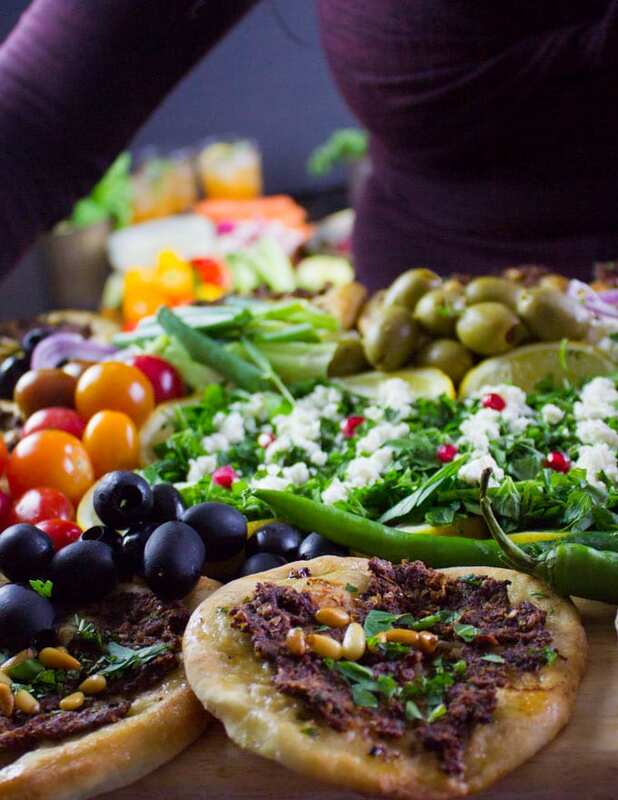 Feta cheese, sliced onions, fresh mint, toasted pine nuts, green chilli, tomatoes, olives, peppers, pomegranate arils and finish off with a squirt of lemon juice. Fold it up and enjoy! Love sharing these types of posts with you guys. 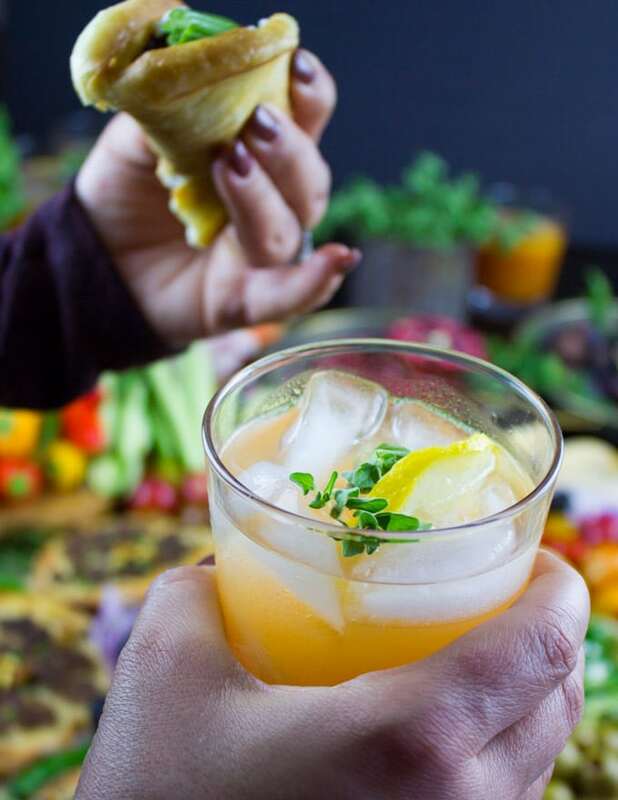 They’re so much fun to create and photograph, plus I always get plenty of volunteer tasters and hand models for the food lol So it ends up being a fun filled day for me! 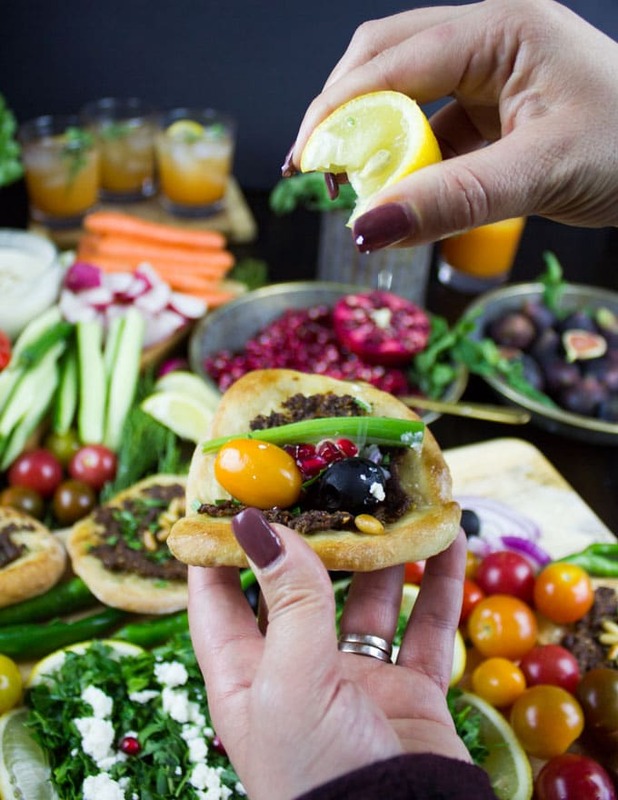 You need to try this one, it’s SO easy and SO delicious. 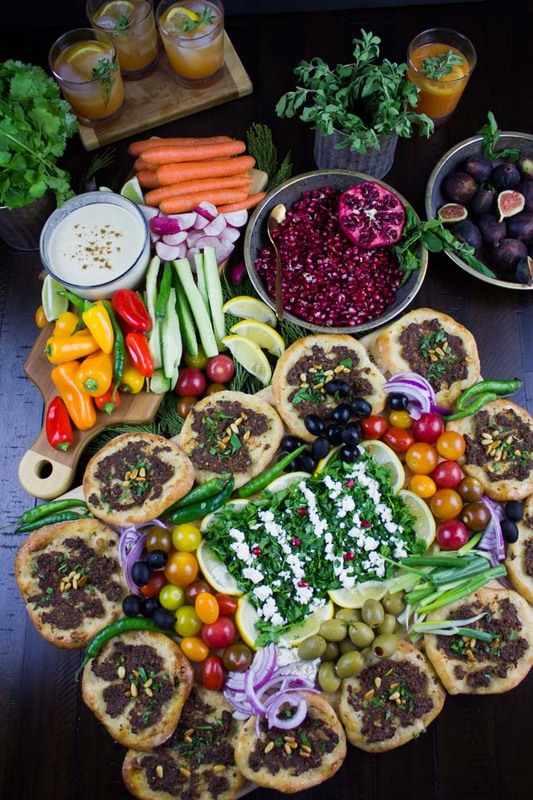 While the post is about a pizza party, it’s absolutely not your average pizza party! First of all, it’s made with my beloved fresh and tasty American Lamb. Whether you’re a lamb lover, a lamb newbie or never had lamb before, I urge you to go for American lamb. The taste and quality are unbeatable! And believe me when I speak lamb, because I grew up on plenty of lamb..plenty! So I certainly know what awesome lamb tastes like! Back to the pizza party! 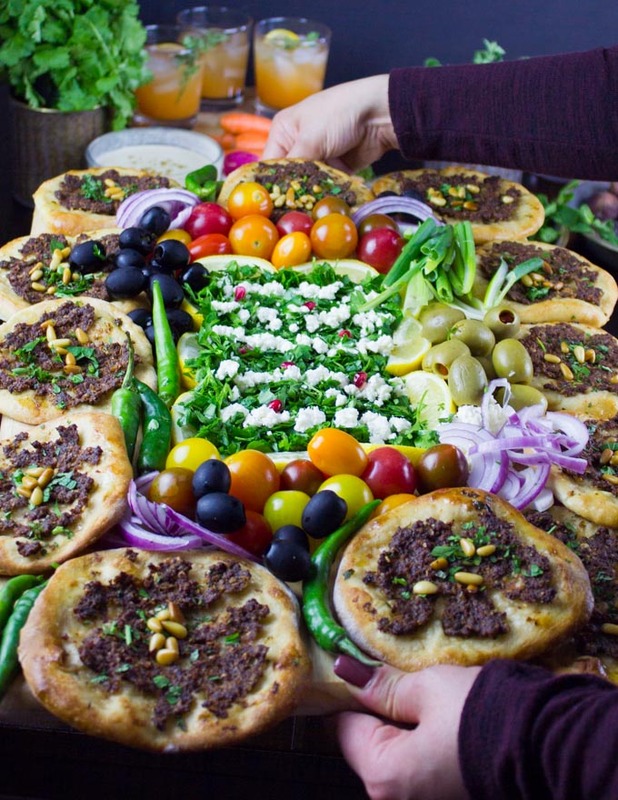 Turkish pizza is probably the only pizza out there that’s cheese-less lol And while that may turn you off a bit, I’m here to tell you wait! There’s so much flavor and texture that’ll make you give up the cheese factor for a change. It’s honestly hard to call it pizza, it’s a completely different thing than how we define pizza. But at the same time, it’s something too delicious to miss out! 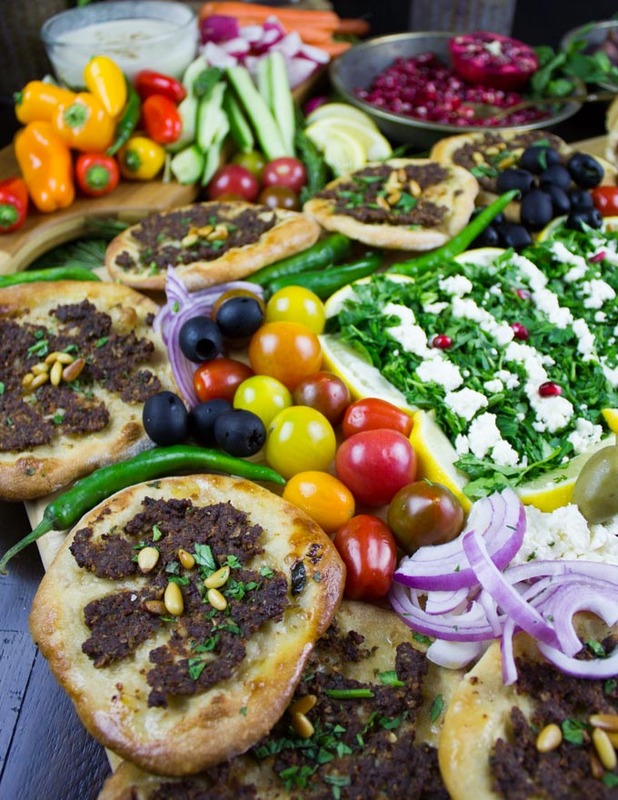 Think of it as a tasty meaty flat bread with plenty of fresh toppings. 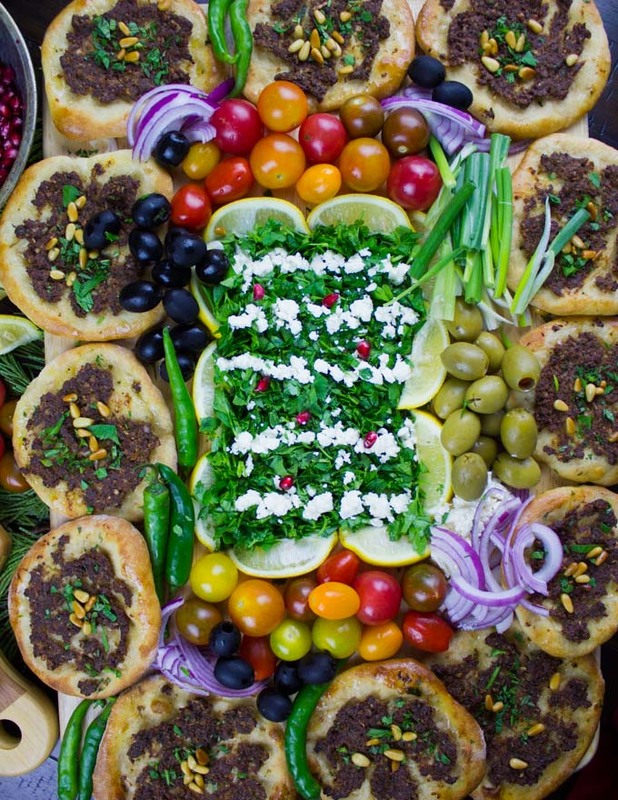 Since Game Day is coming up, I can’t think of anything more fun than this Turkish pizza party! Before having kids,I used to put so much effort going to the stadium, cheering throughout the Game even if I came home with a sore throat. However, things have changed now lol The good news is eventually I started to love staying in, and hosting the game much more than going out. I still get to cheer, just not as loud. For some reason, it seems like most of my friends prefer staying in too, so yay!. 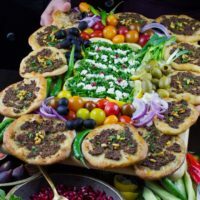 The beauty of this recipe is to prepare the Turkish pizza ahead of time, and serve the toppings separately so everyone can enjoy their pizza their own way! To add a touch more fun, prepare a rustic looking stadium like this one! 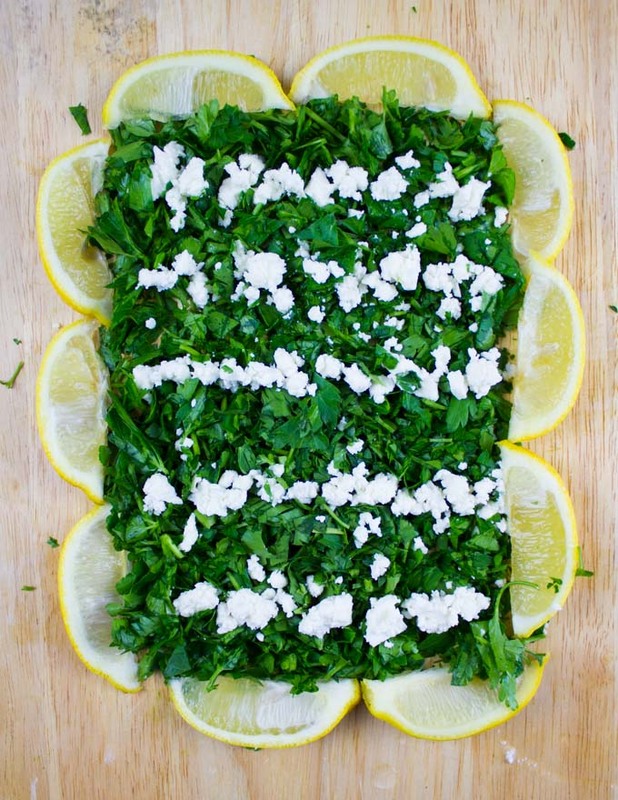 On a large cutting board, spread chopped parsley in the centre and form it into a rectangle shape to make it look like a football stadium. 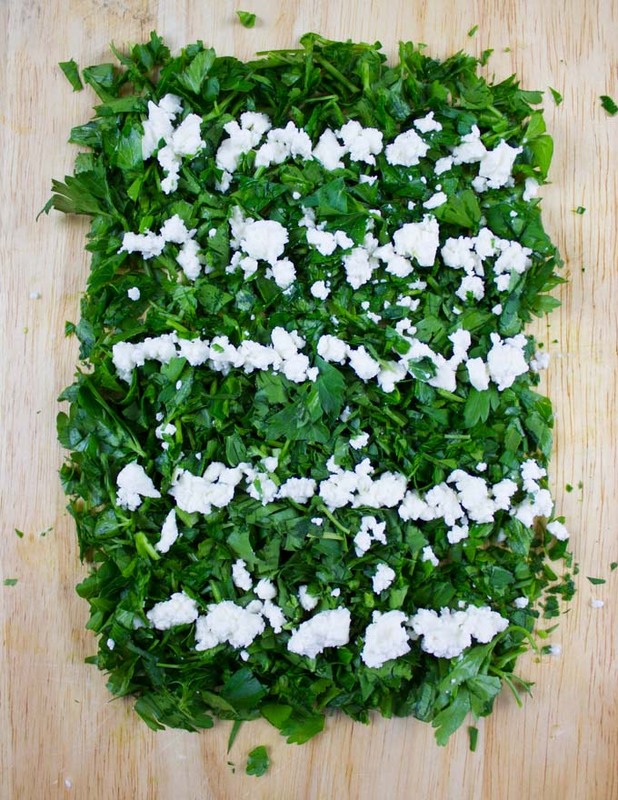 Line that parsley stadium with lines of crumbled feta cheese. 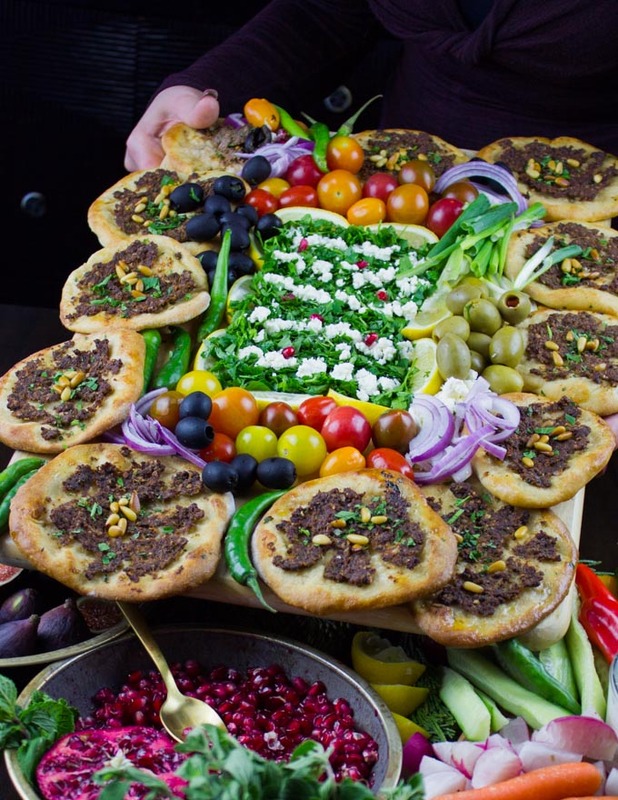 Then arrange some lemon wedges around the parsley to form a rim around the stadium, and add in a few pomegranate arils to look like the players. 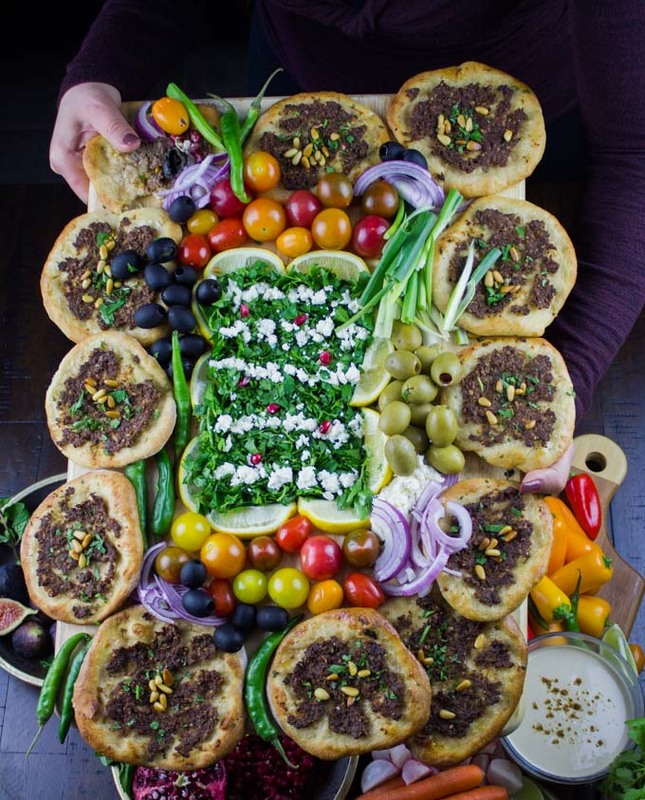 Now arrange the pizza toppings all around that stadium and finish off arranging the mini pizzas around the edges of the cutting board. Super easy, delicious and fun Game Day Food!! 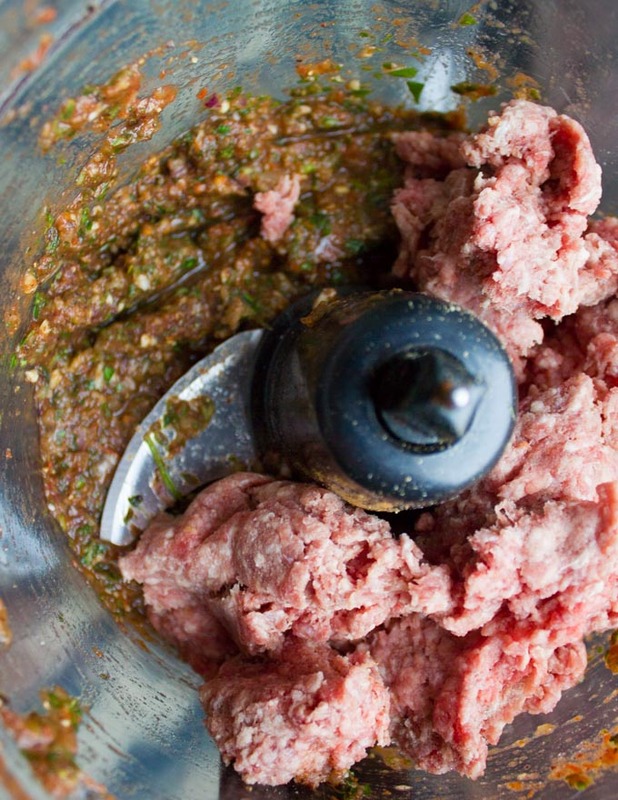 A few tips on the meat mixture, make sure you process the ingredients first and then add in the lamb to the food processor and process until it’s a rough paste. 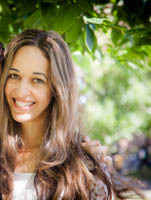 The mixture shouldn’t feel watery or runny, rather clump on itself. when it comes to the dough, you can use store bought or make this Homemade Pizza Dough or this Overnight no knead Pizza Dough. Quite frankly, the star of this pizza party is surprisingly not the dough, it’s the lamb mixture and the toppings! 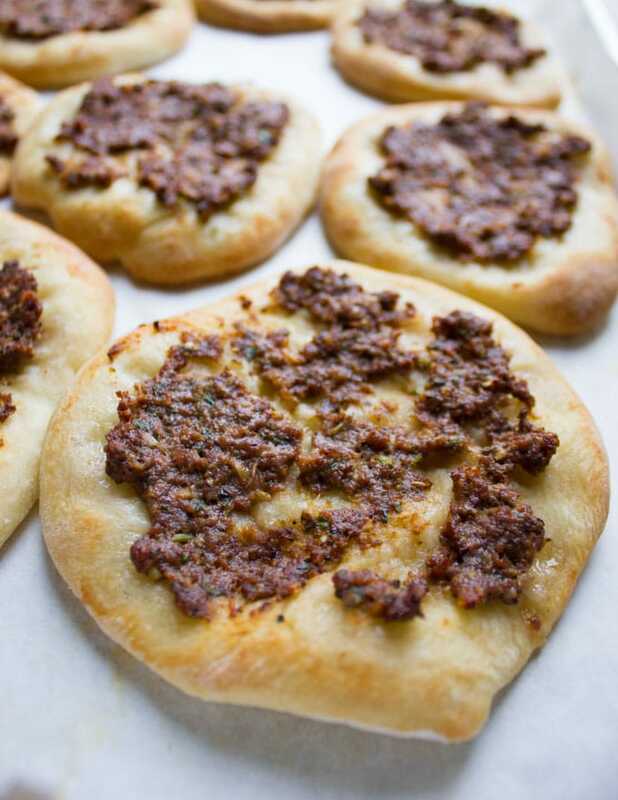 Finally, these Turkish pizzas bake at a high temp oven, so preheat your oven ahead of time and keep an eye on them because every oven is different. If you’re making the pizzas ahead of time (which I always do! ), just freeze the ready baked pizzas once they cool down. On the day you plan on serving them, pop them in a 350 degree oven for 10 minutes to reheat. 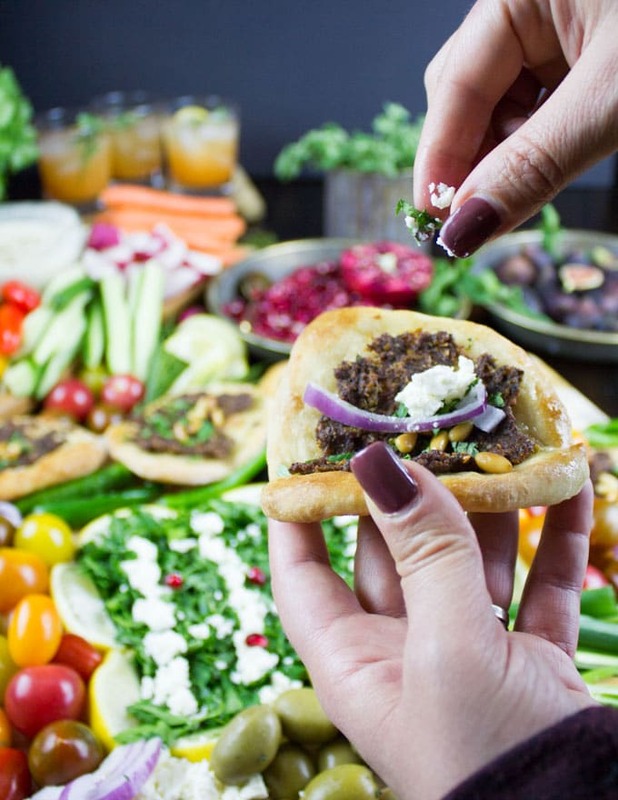 Also, if you’re a burger person—you can’t miss the Best Lamb Burgers with Nachos Toppings recipe! 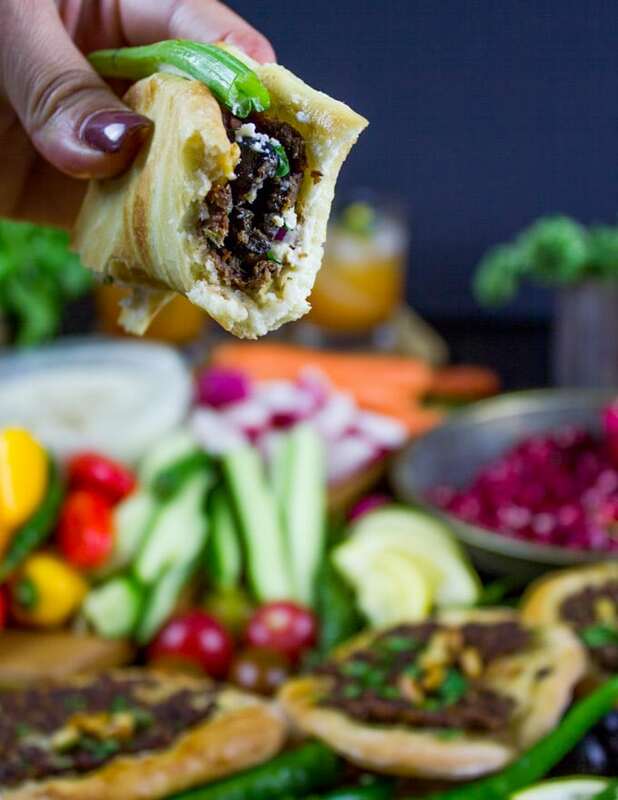 And if you’re looking for fun wraps, check these Spicy Harissa Lamb Shoulder Chunks in Pita Cones with Tahini Dressing. 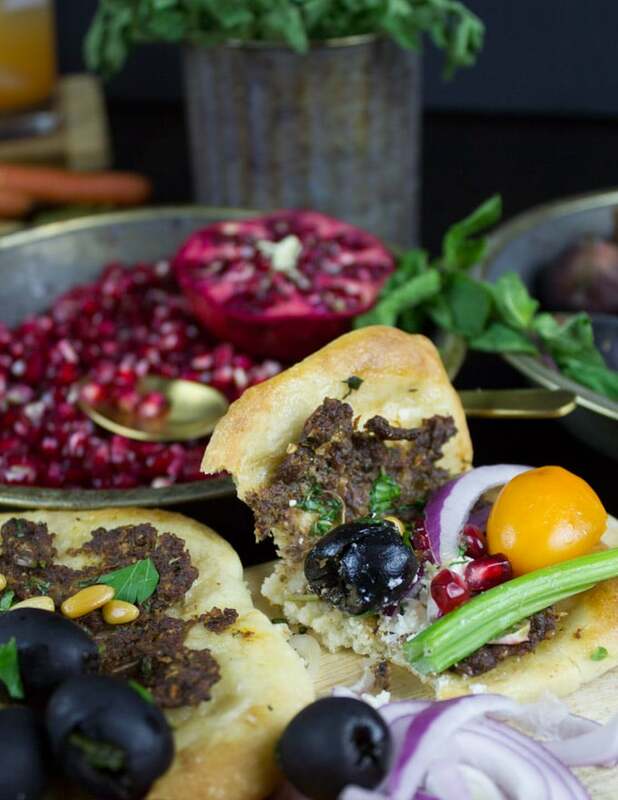 Another flavor packed recipe is this Ultimate Lamb Kebab Platter, and if you’re enjoying some BBQ weather right now, try these Grilled Lamb Chops with Black Olive Herb Butter—succulent goodness! On a side note, if you’re enjoying BBQ weather right now, I envy you! About 2 cups of bread flour All purpose flour works too! Preheat the oven to 500 degrees F. Line two baking sheets with parchment paper and set aside. Prepare the pizza dough ( instructions below) or use store bought and ready to use dough. 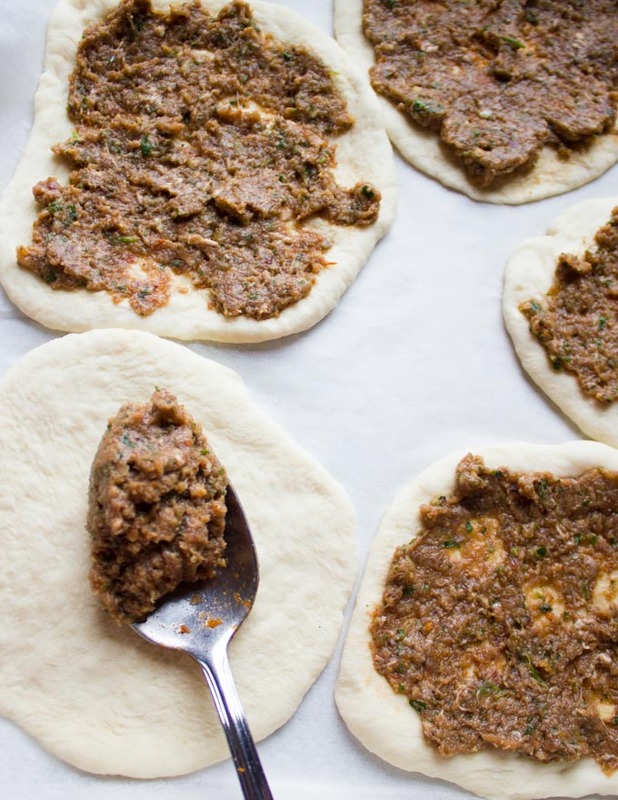 Divide the pizza dough into 18 pieces. Roll out each piece at a time into a circle about 1/8th of an inch thick and 2 inches in diameter (it doesn’t have to be perfect, just a rough circle) and place each on a parchment paper lined baking sheet. 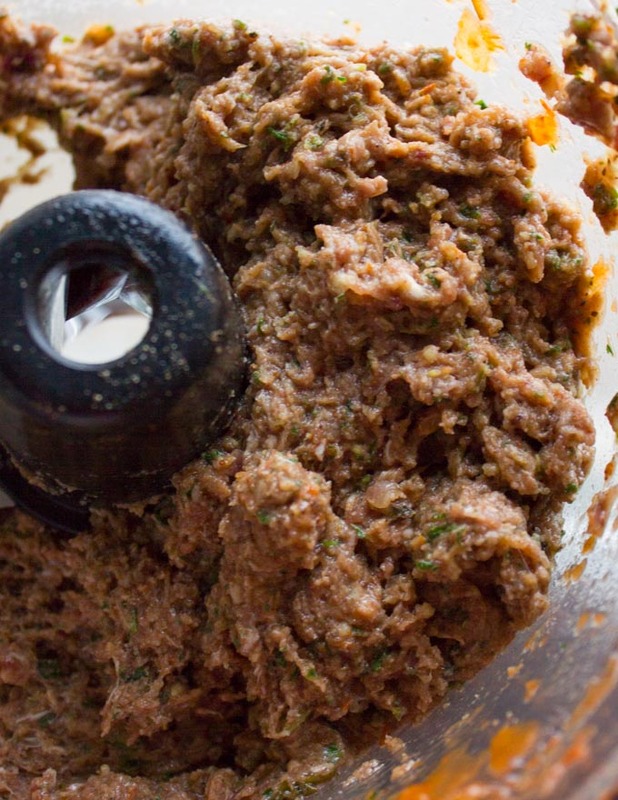 In a food processor, pulse all the lamb ingredients minus the lamb into a thick salsa like consistency. Add the ground lamb and pulse the mixture together until you have a rough paste like consistency. Take a tablespoon of the meat mixture and spread it over each pizza dough, distributing it with the spoon as evenly as you can. It should be just a nice thin layer. Press the lamb mixture down very gently to make sure it sticks well to the dough. 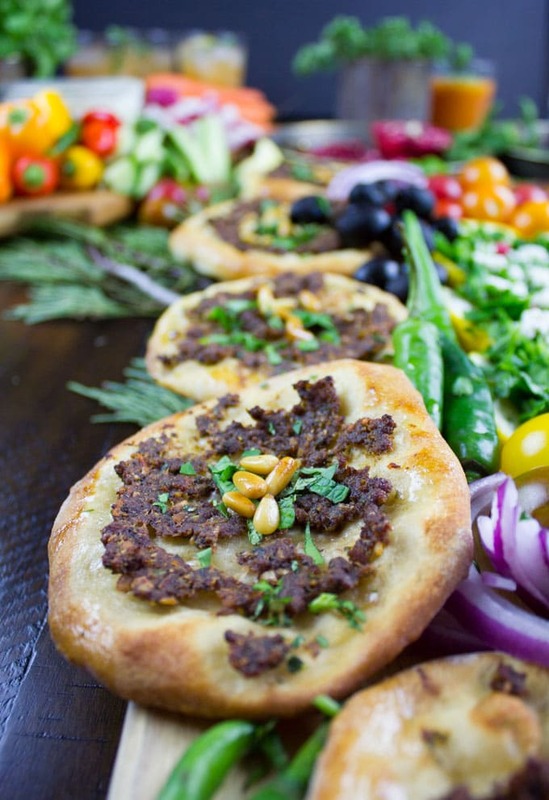 Bake the Turkish mini pizzas for about 8-10 minutes until all cooked through. Depending on your thickness and size of the pizza, you may need to bake them for up to 12 minutes. Just make sure they aren’t too crispy on the edges so that way you can still roll them into a wrap. When pizza is done, sprinkle each with fresh parsley and mint and serve with the toppings on the side. Add and any topping you like on your pizza—the more the better! The lemon squirt is essential! Fold each pizza over and enjoy! In a mixer bowl, add the flour and salt and mix them well. Then add the honey water mixture and knead the dough until smooth. This dough should not be sticky, but should not feel hard or dry to the touch, it should stick slightly to your fingers. Cover the bowl with plastic wrap and let the dough proof (rise) in a warm spot (like inside your oven while it is shut off) for about 1 1/2 -2 hours until the dough doubles in size at least. Now it’s ready to be used for the recipe above.